My youngest daughter came for dinner last night and did a feeding for me. Yeah! 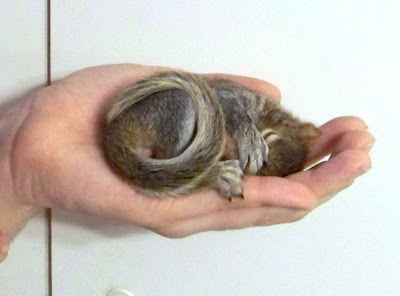 Like all babies, the squirrel baby gets sleepy as she's eating and is out when she's done! Reminds me of nursing my own precious babies. Ahhh, what precious times and cherished memories! I took this shot of her holding the baby. When I look at this picture all I can think of is how helpless we all are in truth. Oh yes, we think we are big and strong and are handling life on our own. We are doing it. But the truth is we can't even get our next breath or heart beat without God providing it. Every second of every day of our lives He is actively aware of us, providing for us, loving us, inviting us to come close to Him, to take Jesus as our Savior and protecting us in His strong hands. 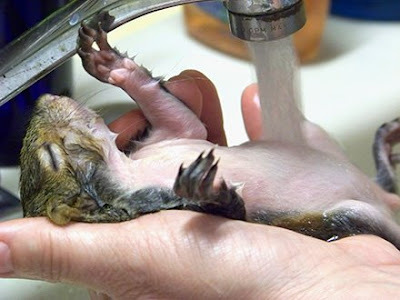 We are as helpless as this baby squirrel. We only delude ourselves into thinking we don't need Him. It's a dangerous lie to believe. If we believe it long enough, we will leave this world without Him and spend eternity in hell with no possible way of escape...as helpless to change our fate there as we are here to add a minute to our lives. The only real power we have is choice. We can choose to repent of our sins and ask Jesus Christ, the only begotten Son of God, to be our Savior, giving Him our lives and all of ourselves and then being immersed in water baptism in the name of the Father, the Son and the Holy Spirit as we are commanded as soon as possible...or not to. I'd love to meet you on the other side on that glorious day when He parts the sheep and the goats. Lord may we all please be found to be Your sheep!
" 31"But when the Son of Man comes in His glory, and all the angels with Him, then He will sit on His glorious throne. 33and He will put the sheep on His right, and the goats on the left. 34"Then the King will say to those on His right, 'Come, you who are blessed of My Father, inherit the kingdom prepared for you from the foundation of the world. 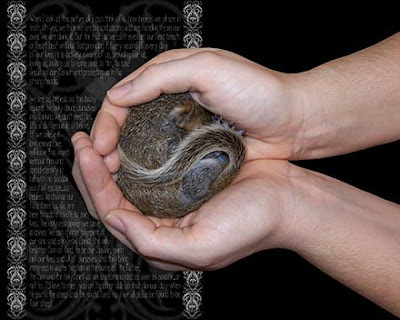 So many of you are enjoying our baby squirrel that I have made you three elements. 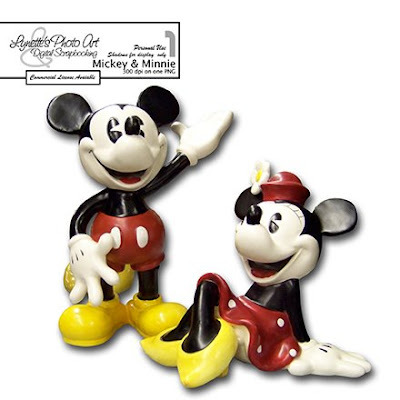 You can also use the cupped hands for a baby! 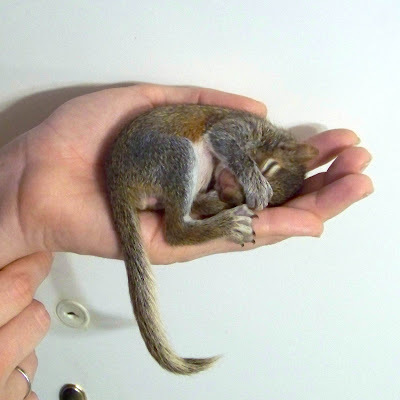 Um...a non-squirrel baby! 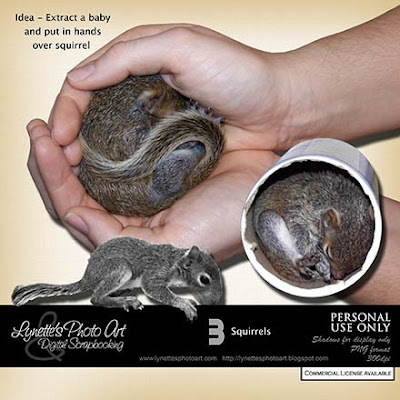 You could extract your baby and put it on top the squirrel for a very dramatic and loving design. Add some journaling and voila! And yes, she sleeps in a salt box, oh so cozy! The texture of these is too cool. 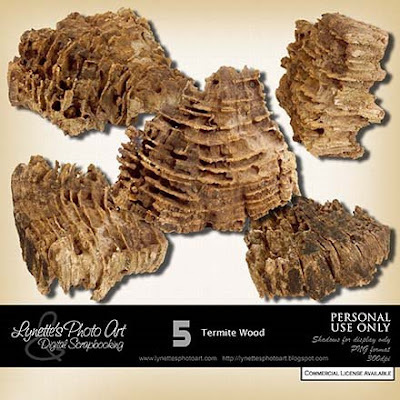 These used to be a cross section of a tree. After years of allowing termites to consume it, this is what's left. 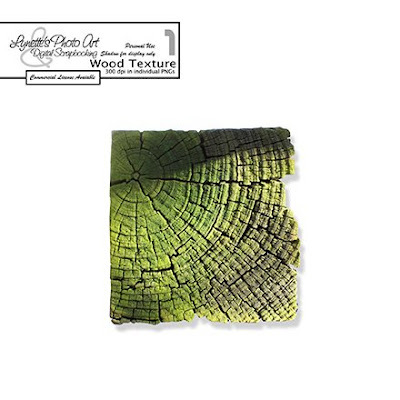 To my artist's eye this texture is so cool and could really enhance many scrapbook pages. But to my spiritual eyes, I see the results of sin left unchecked. This wood is a good example of what happens as we allow ourselves to live in "gray areas", no longer cleaving to His holy Word and ways above all else. That seemingly harmless compromise starts eating away at us spiritually like the tiny termite started working on this substantial slice of wood when it was perfect and beautiful. I couldn't have imagined the wood would look like this one day. I just let it lay in the yard. I wasn't vigilant. I didn't watch carefully. Are you letting "gray areas" live in your life? We don't nnotice the damage until it's severe like this wood. Yes, while there is life, there is hope. As long as God grants us life, we can always repent from our hearts and turn to Jesus and He will forgive us as if we never sinned. He will wash us and cover us with His saving grace. But the fact is that more often than not, once we are this far in sin, most don't repent and ask Jesus to save them. That "gray area" sin that was like a tiny termite in the beginning that we could easily have crushed, becomes stronger in our lives each time we compromise until, like this wood swarming with countless termites, we are utterly overwhelmed with sin and can't get ourselves loose. Satan's plan has succeeded to damn you to hell for eternity, and it was all your free will choice. God does not tempt us, but He always provides a way of escape - let's be vigilant and watch for the way of escape and choose to take it! Let's be like Joseph who literally RAN from sin, not stupidly try to see how close we can get to sin without actually sinning. Genesis 39:7-12 If we have truly given our lives to Jesus, we no longer want to play that fool's game, but we long to live holy lives that are pleasing to Him. Winnie update - She went outside for the first time (without me wearing her and her hiding in my clothes or hands). See her squint? 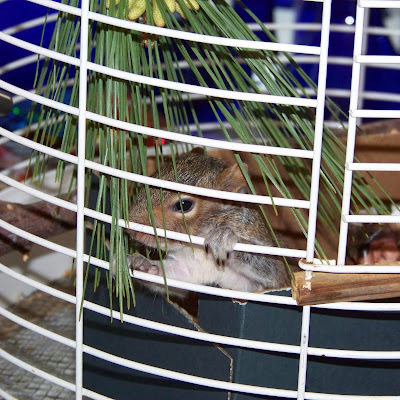 Her cage is in a sunny bay window, but this was still much brighter! She was a bit afraid and just wanted held. We made it a brief adventure. And right now Daddy says she's biting him and he wants me to come feed her...so bye! I found a great site while visiting the Scrappin' Cop. It's called YourFont and you can make a font from your own handwriting that works in both PC and Mac in any software...and it's FREE! How fun it'll be scrapping our family's memories in our own handwriting! But here's a thought my daughter gave me...though this makes it possible to add our actual signature to things with one keystroke and that's pretty cool...might not be a good idea to use it on line, like on our blog posts, etc. Identity theft is the fastest growing crime and if we literally hand them our legal signature on top of their stealing our personal info, it could make it MUCH harder to dispute that it wasn't you doing the contested transactions. Remember that all they have to do is right click almost any graphic on line and they can save it to their computer...including your signature. Have you ever noticed how your handwriting tells things about you? Some have very free and artsy signatures and that shows us they are creative, free and easy. Others write tiny, tight letters showing they are constricted and all bunched up inside. Some print oh so neatly showing they might be a draftsman, engineer or someone who works with precise things. Maybe their signature isn't even legible showing they just can't be bothered! Ok, these are not carved in granite, but our handwriting does show things about who we are inside. Consider that God's handwriting completely covers this earth He has made. Ponder what His handiwork says about Him, about who He is. The grandure of mountain scenes. The soft and tender spring meadow dotted with flowers and butterflies. Powerful waves crashing on breakers. His brush strokes from one edge of the sky to the other, dramatic and different every morning and night. Dazzling rainbows as reminders of His promise. The ballet of schools of fish in the sea mirrored in the flocks of the skies. The contrast of thundering waterfalls and delicate mist rising from them. Graceful swans and ungainly warthogs. The softness of fur and the hardness of shells. The songs of birds and the roars of lions. Color. Music. Dance. Love. Beauty. Power. Majesty. Purity. So much more than I can write here. Let's really look at God's handwriting and ask Him to revel Himself deeper to us and let's praise Him for all He is and all He does and all He will do for those who love Him and take Jesus as their Savior. Want a Winnie update? She nibbled her first greens today and has moved up to a much bigger syringe for her formula. But she's still just a little baby who wants to be held all the time. And yes, that's her hind foot covering her face. 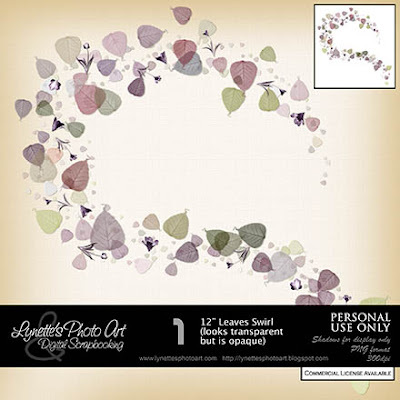 This is a very soft and lovely 12" leaf swirl that can easily be sized down. It looks translucent, but it's actually opaque. Still I like it best on light backgrounds. I can't wait to get a chance to use this...or anything I've made for you!! LOL! The tiny crocus flowers are courtesy of Grannyart - thank you! She gives so much away every day and with no restrictions on use - be sure to drop by and thank her! Again we come to another discussion of "balance". God teaches us balance. Here is yet another example of mankind today getting out of balance on a subject. "Then God said, 'Let the earth bring forth living creatures after their kind: cattle and creeping things and beasts of the earth after their kind'; and it was so. 25God made the beasts of the earth after their kind, and the cattle after their kind, and everything that creeps on the ground after its kind; and God saw that it was good. 27God created man in His own image, in the image of God He created him; male and female He created them. 30and to every beast of the earth and to every bird of the sky and to every thing that moves on the earth which has life, I have given every green plant for food'; and it was so. God made man and paraded all the animals before him and charged him to give them names. God gave us control and stewardship over the animals. He told us to rule over them. He told us to multiply, fill the earth and subdue it. We certainly have filled the earth and subdued it. We have come to the point where we need to protect and help many of God's creatures as part of our stewardship over them. God created them for our use and pleasure, but "stewardship" includes being a good caretaker. There are those who have lost their balance. In trying to fulfill the charge God gave us to rule over and care for His creation, they have abandoned the loving and saving truth of God Almighty who created us and all that is, who holds every one of our eternities in His perfect hand, He who is worthy of our worship and service, and they have elevated God's creation, the work of His hands, it's creatures and plants, to a place of worship, just as He warned we would. 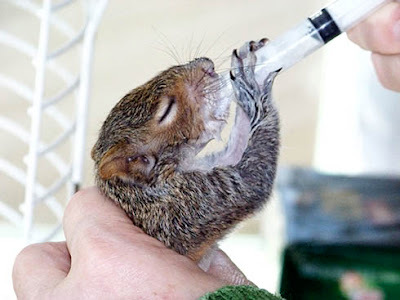 It should be obvious if you have been reading this blog, that I love animals and have worked with the Wildlife Rescue for years. I am the one people bring day old sparrows without a bit of down to. 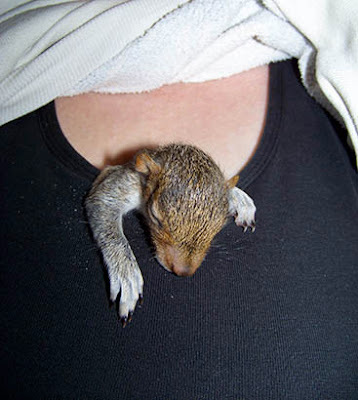 I'm the one people bring kittens with their eyes still closed or tiny squirrels to to rescue. I feed and care for babies every two hours around the clock for months, whatever is needed to prepare them for release or a home, whatever is appropriate. You should also have noted that I cherish this world's plant-life, rocks and vistas. It's not just words with me, I put my time and labor into it and live it. I have cared for many kinds of animals and deeply love them, but I do not worship them. They are not more important than man whom God has made in His own likeness, breathed His breath of life into and given an eternal soul. Man is far more valuable in God's eyes as demonstrated by His sending His Only Begotten Son, Jesus, to live here with us, teach us and give His life as the perfect sacrifice on our behalf to save us from our sins, if we will love and obey Him. When protecting animals starts harming people, it is out of balance and contrary to God's will which is above all human reasoning and laws. Let's keep things in balance as we drink in the amazing blessings God has given us through all of His creation - the beauty of the landscapes, the charm and fellowship of His creatures, the rich blessings of His plant-life. Let's fully enjoy these great blessings and remember to honor and thank the One who made it all for us. Let's be sure to praise His Holy Name every time our hearts warm at the sight of a sunset, a baby animal, a fragrant flower, a fresh stream or a majestic vista. He did it all because He loves us. He provided all this as a place we could live while having the choice of whether we will love Him back and live with Him forever, or whether we will reject Him and choose to burn in hellfire forever. Let's keep things in balance. Let's deal with what's most important first - man and his eternal destination. Jonathan & Cheri - Thanks for writing! It means so much when people write. 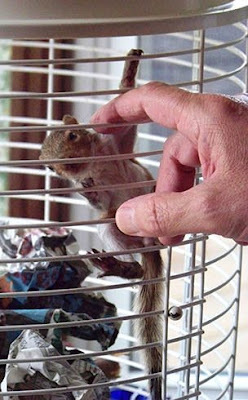 To answer your question, people just bring me helpless little creatures they find, have for decades. 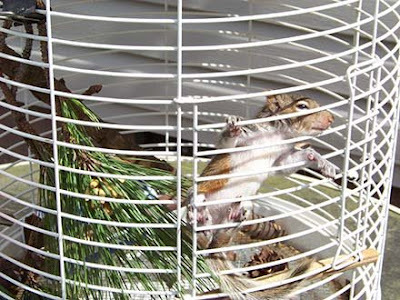 My suggestion to you is to contact the Wildlife Rescue in your phone book and volunteer to rescue squirrels. They always need help in all areas and are normally such nice people. Please read back in my posts to see that though they are wonderful babies, they are NOT pets. You should release them at 12 wks. into a safe area with the only exception being those crippled and unable to survive in the wild. Good luck! Winnie update: Can you believe how long she can stretch? You can tell this was before a feeding...tummy all gone! Her fir is thickening a lot and her tail is getting fluffier. Little wobbly Winnie trying to hold on to my arm here at the computer. So many of you have liked our new baby Winnie that I thought you might like to use her as an element. This was before her eyes had opened. 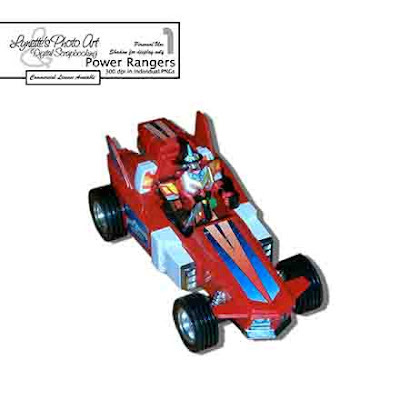 I was surprised how many of you have wanted my chipmunk element, so maybe you can use this sweet baby. There are more to come! This is nothing but the old fashioned "chain letters" that threatened superstitious people that bad things would happen to them if they didn't send them on. The enemy simply changed the contents of the letter to look "Christian" so that well meaning brethren who weren't spiritually discerning would spread his evil superstition throughout the church under the guise of being "spiritual" and "friendly". We need to always view all of life through what the Bible says. Always discerning good from evil. As Christians, we no longer desire to participate in evil, but long to be worthy ambassadors for Christ. We want to be those "lights set on the lampstand" to light the world with His truth and liberty. We know that people watch us and we have the ability to edify or harm both those in the body and the unsaved by our actions, our speech and our attitudes. Let's be more careful to discharge the service our King has given us to do in purity and in ways that bring Him honor and not causing others to stumble. Let's clean our lights and be effective worthy workers for the kingdom! If you like something in one of these forwards, hit forward, then DELETE EVERYTHING THAT IS NOT IN KEEPING WITH THE WORD AND WILL OF GOD before you send it on. It's that simple! Superstition, magic, mediums, witchcraft, astrology and the such are all soundly condemned in the Bible. When ask Jesus to save us, we are taking Him not only as Savior, but choosing Him as Lord and Master of our lives. We are being bought with a price. We are vowing to obey Him and His commands for the rest of our lives. We give up our right to refuse Him. (And all His commands are for our good, not to deprive us of any good thing, but rather to avoid the harm that results from them.) Why do we think that as mere dust we have the right to pick and choose which of God's commands we obey and which we don't? Can we save ourselves? Can we raise ourselves from the dead? Can we make or debate God into letting us into Heaven? Winnie update: She ventured onto a branch for the first time today without me putting her there. 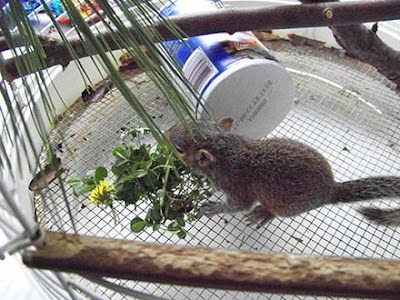 She's very wobbly and a bit scared, preferring the rungs on the cage. The wood perch at the door of the cage really throws her. It's there from when birds lived there. A couple of times she's gotten all the way out, but couldn't successfully navigate the wood, gave up and went back to her salt box home. It' won't be any time till all before she's a pro! Here she's just fallen off again! Scrat never nibbled me, but Winnie does. It doesn't hurt...yet. So I offered her this pine bark and she tried her first nibbles yesterday. She didn't today, but she will. This one's crazy funny! These are a favorite. My daughters gave this bow to me for Christmas one year. Yes, the bow was a gift! In amongst their gifts for me was this bow, simply because they knew I would adore it - and I still do! It sparkles more than you can imagine. I like sparkles :) So, I found the room with the light that makes it sparkle the most and have left it on display in that room ever since! Makes me smile each time I see it. Even crazier is I have WASHED IT IN WATER REPEATEDLY (dust) and it is unscathed! Now that's quality! Thanks girls - I love it! 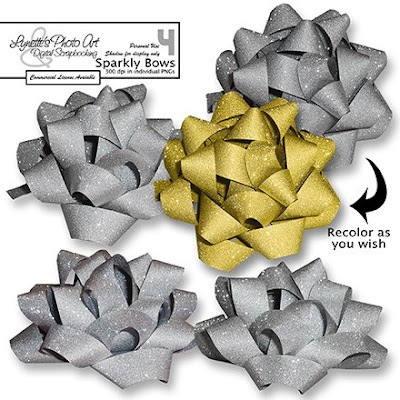 These are easily recolored and are very good quality. When we ask Jesus to save us, we are taking Him not only as Savior, but choosing Him as Lord and Master of our lives. We are being bought with a price. We are vowing to obey Him and His commands for the rest of our lives. (And all His commands are for our good, not to deprive us of any good thing, but rather to avoid the harm that results from those things.) Why do we think that as mere dust we have the right to pick and choose which of God's commands we obey and which we don't? Can we save ourselves? Can we raise ourselves from the dead? Can we make or debate God into letting us into Heaven? Our little Winnie has quite an on-line following, so here are the newest pics for you taken by my oldest daughter last night. After feeding, she gets a nice warm bath and you can see how she feels about it! :) She'd stay there limp as a rag all night if I had the time! She also adores being dried off and makes yummy sounds...our Scratbaby did too. 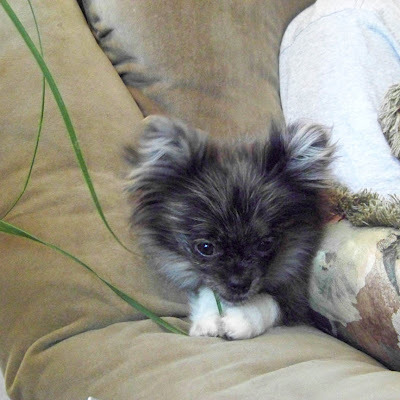 My youngest daughter named her Winnie for being a winner and getting rescued. Today she tried chewing on a bit of pine bark for the first time. Those are Dogwood and Grape Hyacinths in the glass that I have been making elements for you from. Check out the previews at the bottom of the right column for all the goodies you will be receiving, so don't miss a day! Sure would love to see what you make with my gifts. 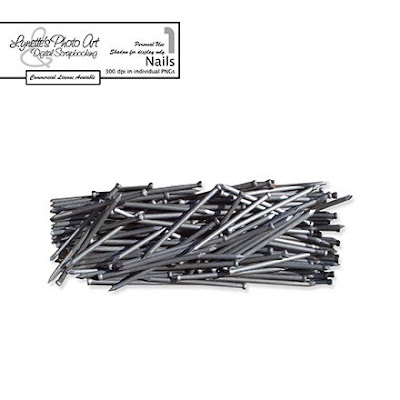 Nails, brushed metal and screws...not just for boys! 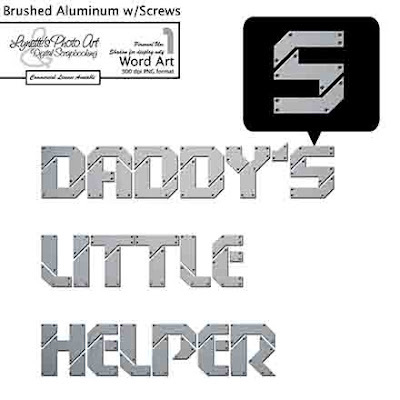 I was my Daddy's Little Helper! Hope you enjoy these. I'd love to see anything you make with my gifts. This is SO important. I've seen this done repeatedly for years by well meaning Christians who are actually greatly harming their brothers and sisters-in-Christ that are already suffering. We know that the Bible teaches that God miraculously heals. I have been blessed to witness it many times. 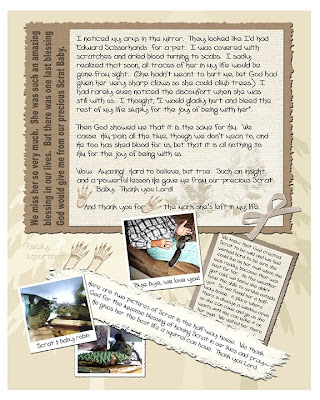 Just read yesterday's post of how He healed my husband very recently. He gives us instructions on how to ask for this. James 5:14 He gives evidence that He does do this, but He does not always do this. He is God and His ways are above ours, He gets to choose. We don't have to understand, only believe He is faithful when He promises to make ALL THINGS work together for the good of those that love Him and are called according to His will. Romans 8:28 We need to remember our place. We have been bought with a price and are no longer our own, but His to do with as He sees fit. He is the supreme God of all. Surely it grieves our loving Father when one Christian speaks to another Christian who is suffering illness or injury and tells them they do not have to be sick, that it's not God's will for them to be sick. They infer or outright tell their brother or sister-in-Christ that if they just had enough faith, they'd be healed. They are telling them that not only are they suffering physically, but it's their own fault because they are failing at being a Christian. They add grief and condemnation to their brother or sister who is already laden down in pain and suffering. In Matthew 25 Jesus teaches us to visit the sick. Do you think He was telling us to visit them, act all superior, blame them for their illness, judging them to be failing Christians of no faith and heap yet more suffering and condemnation on them? Is this what our Savior taught us? He taught us to lift others before the Father in prayer. Not everyone was healed in the New Testament, even apostles. In John 5, there were many sick and crippled laying by the pool. Jesus healed only one of them. In John 11, Lazarus was sick. Jesus did not come until he had died (and then raised him from the dead to the glory of God). In Acts 5:15 People laid the sick in the streets so that as Peter walked by, his shadow might fall on them and they be healed. He did not heal them all. In Philippians 2:19-28 Epaphroditus was sick unto death. Even as a friend of Paul's and in his presence, this brother was ill for a period of time before he got well. 2 Timothy 4:20 Paul says he left Trophimus sick at Miletus. Matthew 9:35 and other scriptures tell us that there is nothing God cannot heal, but the scriptures above and other scriptures show that He did not always heal everyone. It even states that at times it was actually His will that they be sick or die, so His power could be shown in their healing or being raised from the dead. Everyone eventually dies. He has not healed every Christian every time these 2,000 odd years. What about the Christian martyrs? Faithful unto death. Deemed worthy to die for Him. Surely at a minimum there were faithful Christian parents fervently praying for Him to save their children. Husbands and wives praying God spare the other. Yet He did not. It was not His will. Aside from the fruit going through this brought in their individual lives and the rewards they have in heaven, God used the persecution to spread the gospel all over the world that more could be saved, as people fled the persecution. Even today when we read accounts of martyrdom we are inspired spiritually to live more holy lives of faith ourselves. His ways are always best, but they do not always include healing and we do not always understand His reasons. Who do we think we are that God should have to explain Himself to us? In Matthew 10:8 Jesus commands us as His followers to heal others in His name, but we are to ASK God to heal, as servants of His, not COMMAND Him to heal as so many do in misguided arrogance. It is still always up to God who He chooses to heal and when and who He chooses not to heal. As He promised to work ALL THINGS for our good. Times of illness and injury are opportunities for us to develop precious Fruit of the Spirit in co-operation with the Holy Spirit in our lives and a closer walk with God. We should encourage faith for healing. We should believe for healing when we pray as He says if we don't believe, whatever we pray for will not happen. James 1:6-7 We as human beings shouldn't be judging whether another remains ill or injured because of lack of faith. Ours is only to encourage in the Word, love them, pray for them, believe for them, help them in any way we can. There are many scriptures showing that healing does not always depend on the faith of the sick person. Some times they were healed "according to your faith" and other times it was the faith of those praying for them. Again, it would be wholly wrong for us to judge another as to which didn't have faith...maybe it was us! And maybe it wasn't His will or His timing. Last thought. It's pretty easy to pray for someone. Let's consider showing our faith by our works. Put legs and hands on our prayers and actually go help them. Bear one another's burdens. Meet their needs as the Body of Christ. Visit the sick. Clean their house. Bring them food. Run errands for them. Make phone calls for them. Watch their children. Give them a ride. Send cards that you really mean and call them and really listen. We don't have to have all the answers, but we can all listen and just be there for someone. Let's not just pray, but be there where the rubber meets the road. Make our days count. Be rich in good works. Our Savior commands it and there are rewards in this world and the next if we will do this and with the right attitude. Remember, we are to do all things as we are working for God and not for man, so we give our very best and don't even consider the sacrifice! Here is a beautiful rare Blue Bird. It was far away so the quality isn't what I'd like, but it was so special I thought you might enjoy it. 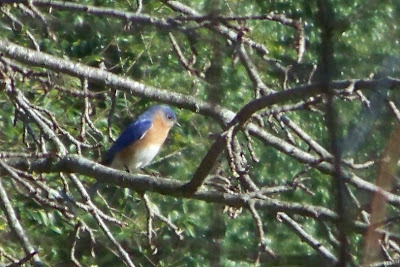 I've had bluebird houses for decades because they are endangered (or close to it), but never had a resident because my area isn't what they prefer to live in. So this was very exciting for me to see two of them for the first time yesterday! Man God made them beautiful! 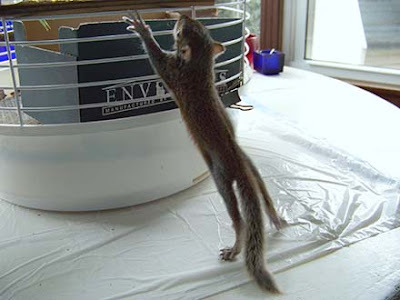 For those of you following our baby squirrel's progress, I've got more pictures today. Once she opened her eyes yesterday, I had to put her in a cage. Today when she woke for a feeding, I opened the door and let her find her way out and try climbing on the outside. The smooth white bottom of the cage really gave her fits! (She sleeps in a salt box inside this little box...all snug and dark!) When Daddy got home last night, we took Boo and hunted some pine things for the little one to start chewing on when she's ready. Just like any baby, when she eats she falls asleep. Mmmmm :) happy! So deeply asleep she can't even hold her tail up any more! 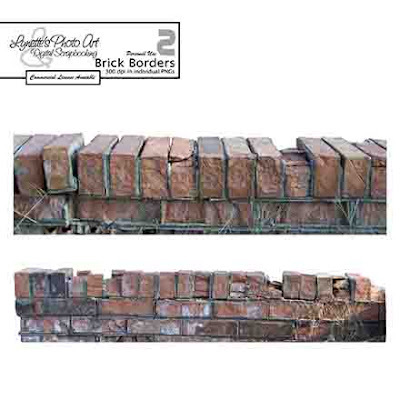 I love the textures of these brick borders. Send me your LOs and I'll post them here! 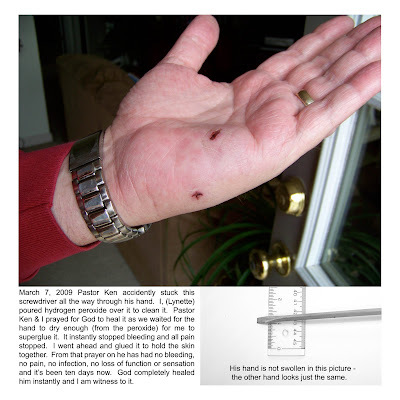 This is my account of the most recent miraculous healing by our Loving God that I have witnessed. Click this image to enlarge. Won't this be fun for your spring LOs? Precious baby leaves emerging to adorn our world as God has commanded! As always, I'd LOVE to see what you do with my gifts! Have fun, there are many more high quality 300dpi natural spring elements coming so don't miss a day! 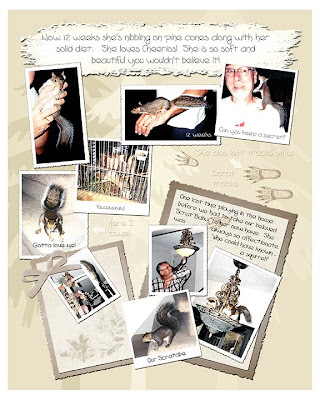 Continuing from yesterday's post about our new baby squirrel and what God taught me through our first Scrat Baby, here is the little book I made to record our time with her and the powerful lesson God revealed to me through it. 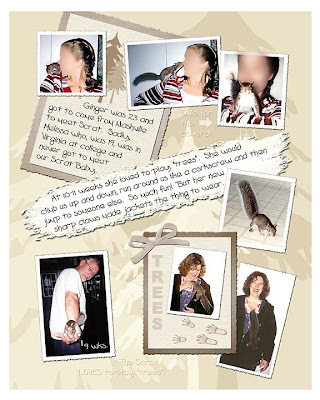 It was my first entry into scrapbooking. I treasure this and hope you will enjoy it too. 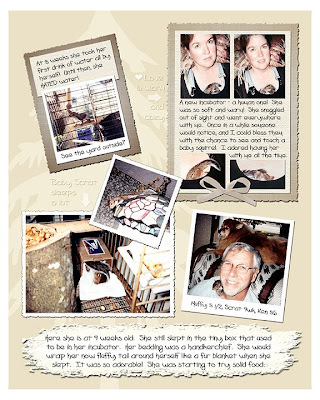 It would be good to share with your children as it documents the development of the baby squirrel. I hope you will be sure to read what God taught me on the last page top right portion, even if you don't look at anything else. Click images to enlarge. Enjoy my book here, but do not claim it as your own. Do not distribute it in any way, but send people to this site to see it themselves. 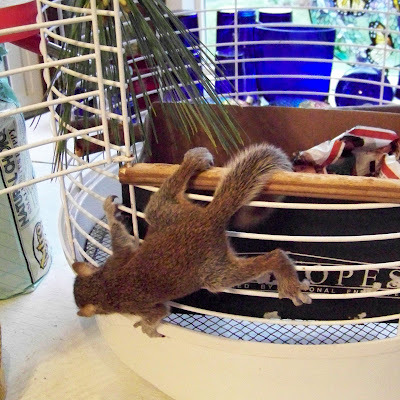 The new baby squirrel (pics on yesterday's post) opened her eyes today and is now climbing a cage. The jacket is to protect my arms a little when we played trees. 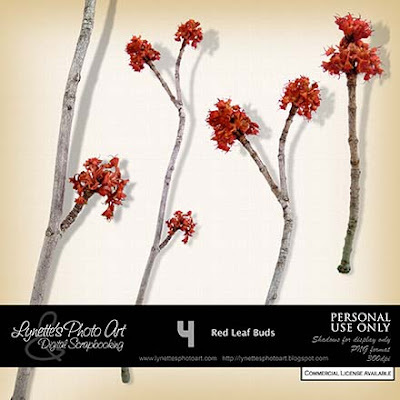 She'd climb one of us in circles as we stood with our arms out like branches. Then she'd leap to the other one and do the same to them and back and forth. It was such fun! The new baby opened her eyes yesterday and she was off! Now she has to be in a cage when I'm not wearing her. It's like she suddenly came to life at 110%! She is really working at getting out of the cage! So different from our Scratbaby. The difference would be how long this one was in the wild. Tomorrow I'll make her first solids available to her, but she'll still need nursed for quite a while. Awwww...how sweet! It's time to feed her again, so off I go! Thank you for all the posts and e-mails! I love them! 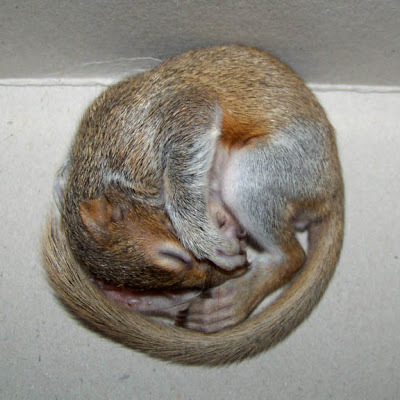 Since so many of you are loving the squirrel, I'm going to give away the "Squirrel Ball" picture from yesterday as an element, so keep watching. 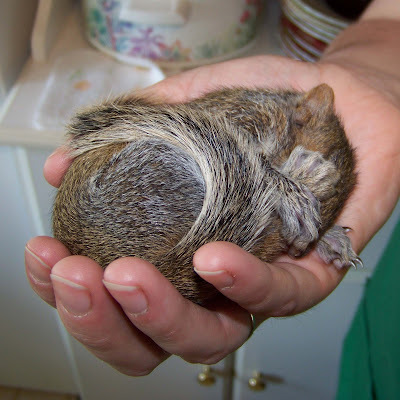 I was shocked how many of you wanted my chipmunk element - maybe as many of you can use the Squirrel Ball! I made this for a layout of my grandson. This is one of his toys. Hope you can use it! 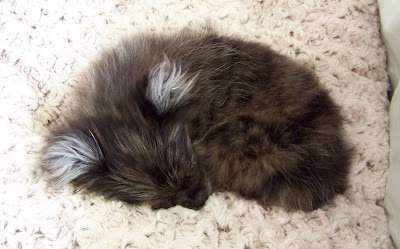 A few years ago my husband brought a very unusual present home from work...it was about 1 1/2" long, pink, curled in a ball, no fur, eyes closed...I didn't know what it was. 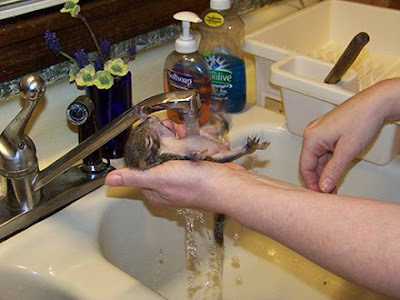 It turned out to be a baby squirrel! We raised it and she went everywhere with me, nestling in my clothes against my skin to stay warm. I was given many opportunities to bless others with a chance to see and safely pet a baby squirrel and talk about his/our Creator. Then the time came to release her into the wild, as God has created her to be wild. Love means doing what's best for the one you love, not what's best for you. We found a halfway house where a window is always open if they want to come in. When we returned home, I caught a glimpse of myself in a mirror. I noticed my arms in the mirror. They looked like I’d had Edward Scissorhands for a pet. My arms were covered with scratches and dried blood turning to scabs. I sadly realized that soon, all traces of her in my life would be gone from sight. (She hadn’t meant to hurt me, but God had given her very sharp claws so she could climb trees, and I was her tree.) I had rarely even noticed the discomfort when she was still with us. I thought, “I would gladly hurt and bleed the rest of my life simply for the joy of being with her”. Then God showed me that it is the same for Him. We cause Him pain all the time, though we don’t mean to, and He too has shed blood for us, but that it is all nothing to Him for the joy of being with us. Wow. Amazing! Hard to believe, but true. Such an insight and a powerful lesson He gave me from our precious Scrat Baby. Thank you Lord! And thank you for the mark she’s left in my life. 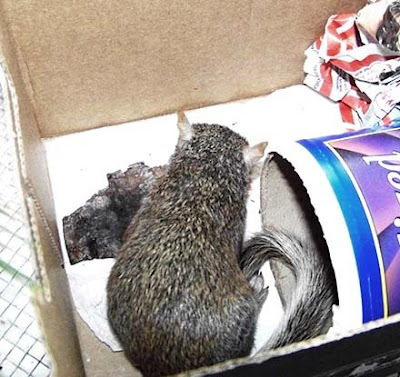 March 16 a call came - my daughters had a friend who had found a baby squirrel and they were helping. They want to take care of it, but they both work 2-3 jobs and one is finishing college. Obviously no time and no way to make feedings every 2 hrs. 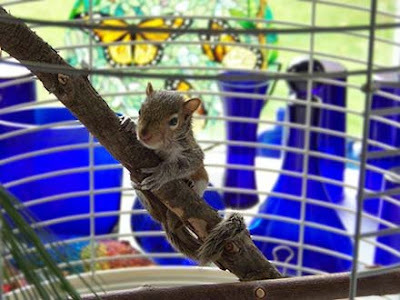 They knew how special Scrat had been in our lives, so now we have a new Scrat Baby! This one's MUCH older, probably 4 1/2 weeks by her development according to charts I've found on line, though they don't match up with my experience with Scrat. 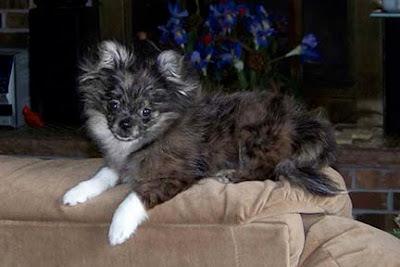 I have to laugh, that we have spent two long, painful years alone since loosing our precious, irreplaceable Muffypuppy on Good Friday, then He sends us a terribly sick puppy 3 wks. ago, requiring lots of extra care (while I was sick too), and now the new Scrat Baby and all the care she takes - at the same time! LOL! Will make me think twice before I pray for others that God will "bless you till you can't stand it!" again! At least we are finally pretty much over our many weeks of being sick now. Puppy steadily improves and now I'm remembering I'm no good at training dogs! Ahhhh! She really needs training! She's so smart and turned 5 months last Monday. She weighed in at 3.5 lbs. yesterday, so her malnutrition is improving. Soon she will be well enough for her shots. 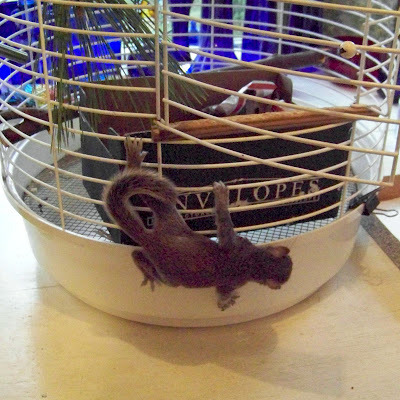 Here's a pic of our new Scrat Baby. Here she is sleeping last night. Her eyes are starting to try to open today. 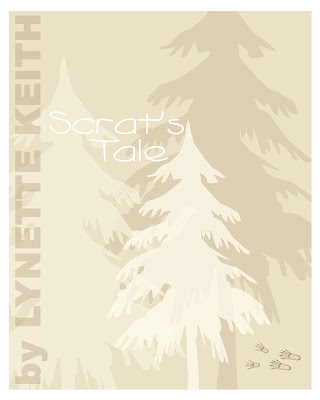 Tomorrow I'll share the little book I wrote about our time with Scrat...Scrat's Tale. 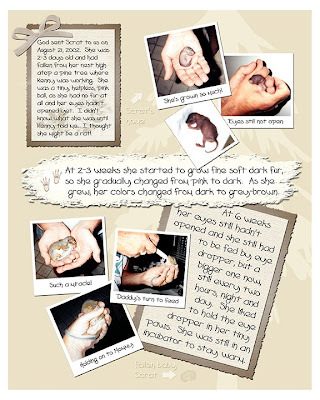 It is good to share with children as it documents the development of a baby squirrel. 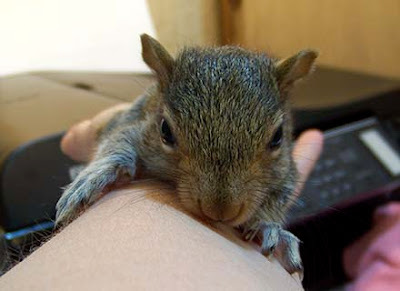 Important note...baby squirrels are adorable and affectionate, but adult squirrels are wild and extremely dangerous! They are NOT pets! 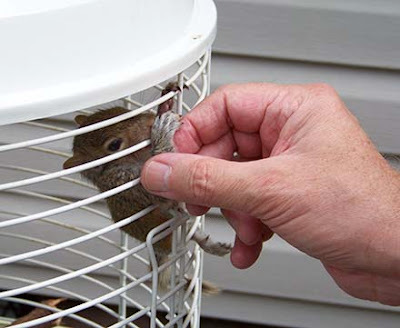 It's a great experience rescuing and raising one, but please prepare them for release. God made them wild. Please let them live the life He created them for. The exception of, course, would be those who are crippled or in some other way unable to live in the wild. This is the last of the 14 Lessons on using your Bible. You can find the other lessons in the archives in the left column or in the label cloud under "Christianity 101". Let me know if you would like more lessons like this. Here are some other things it’s helpful to understand. A Messianic Jew is a Jew who has accepted Jesus Christ as the Messiah. The collection of Jewish Law and tradition consisting of the Mishana and the Gemara, either the edition produced in Palestine about 400 A.D, or the larger, more important one produced in Babylonia about 500 A.D. Some people believe that Jesus is mentioned in the Talmud. So, have you liked this little lesson series and found it helpful? Would you like more like it? I am always interested in what you like and want more of, in posts and in gifts. It would also be great to see what you are making with my designs. If you don't want me to post them here, just tell me and I won't, but it's still nice to see. Your comments mean a lot to me, thank you to everyone who takes a moment to post! God for giving it to you to brighten your life! 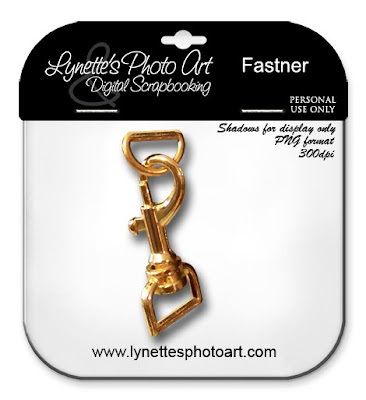 This is the treated end of a 4x4 I just love and have used it on several things. Enjoy! 500 BC: Completion of All Original Hebrew Manuscripts which make up The 39 Books of the Old Testament. 382 AD: Jerome's Latin Vulgate Manuscripts Produced which contain All 80 Books (39 Old Test. + 14 Apocrypha + 27 New Test). “Inspired” means “God breathed. Scripture is that which comes from God and is God's own Word. Scripture is the Word of God (not merely contains), as Jesus affirms in John 10:35. The Bible is a compilation of works by more than 40 authors, written during a period of about 1,600 years, yet it is unified in spirit, outlook and inspiration. The authors had many different backgrounds. Some had exclusive education, others were farmers or fishermen who had never had any formal education. Some were soldiers, others were court officials. They didn't come from the same country, either. And each one had his own way of expressing himself, his own personality. -their prophecies of the future. The original languages of the Bible were Hebrew (Old Testament), Aramaic (a few scattered parts of the Old Testament), and Koine Greek (New Testament). The word Bible is derived from a Greek word (biblos) referring to papyrus (in later Latin, biblia), and the word Testament from a Latin word (testari) meaning to witness. At key points in early church history, church leaders met and tested the writings to determine which should be considered truly authoritative. These books came to be called canonical, from the Greek word for a measuring stick (kanon); they later became what we today know as the Bible. The Bible is composed of 66 books (39 Old Testament, 27 New Testament). The early Christian church did not "decide" what books were authoritative, but they did recognize the unique nature of the works that we know as the New Testament. In his Easter letter to his congregations in A.D. 367. Bishop Athanasius of Alexandria, Egypt, listed the 27 New Testament books as "divine" and called them "springs of salvation." In A.D. 397, at Carthage in North Africa, a church council met (with Augustine in attendance) and confirmed the canon of the New Testament. After that, very little significant discussion about which books belonged in the Bible took place until Reformation times. The Holy Spirit, who inspired the writers of Scripture, also guided the Christian church to identify which books are, in fact, part of the canon. The canon of the New Testament (the list of books considered to be Holy Scripture) was shaped by several factors: the desire to know about Jesus and His teachings, the need to fight heresy and persecution, and for use in worship services. Ultimately, as with the Old Testament, the books that became the New Testament impressed their readers as being different, special, and having the "ring of truth" about them. Most of the New Testament books are connected to an apostle as well (Mark is associated with Peter, Luke with Paul). The Old Testament (Hebrew Bible) canonized around 300 B.C. The entire New Testament as we know it today was canonized around 375 A.D. The first translation of the Bible made into English was in 1382 A.D., by John Wycliffe. The Bible was first printed in 1454 A.D. by Johannes Gutenberg who invented the "type mold" for the printing press. It was the first book ever printed and still today is the top selling book in history. There is a list of the books of the Bible near the front of most Bible. It shows the abbreviations for each book’s name. A number of leather, papyrus and copper scrolls dating from 100 B.C to 135 A.D. containing partial texts of some of the books of the Old Testament (Hebrew Bible) and some non-Biblical scrolls, in Hebrew and Aramaic and including apocryphal writings, commentaries, hymns and psalms; found in caves near the Dead Sea beginning in 1947. They are believed to be part of a library of strict Jewish sect, the Essenes. The scrolls shed light on a type of Judaism that existed when Jesus lived and include the oldest known manuscripts of books of the Bible which have proven that we have accurate translations today. Yesterday some people had difficulty downloading the PaperDolls. I've re-uploaded and here is a new link. It works fine for me - let me know if you have trouble. 4shared has messed up download counts for days and now this...pray for them so our freebies keep flowing! 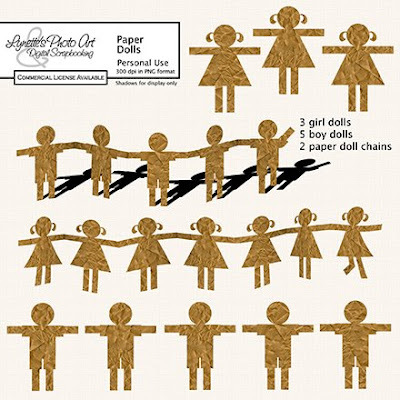 Go back to yesterday's post to download the PaperDolls. 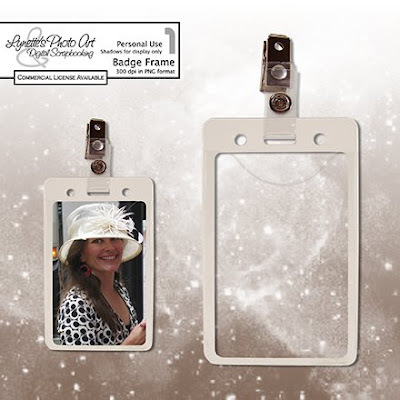 Today I'm giving you this great Badge Frame. It's the style where you slide your photo in the clear front pocket. The woman in the sample is a random pic I got off the web. Jewish scribes had the weighty responsibility of making copies of the Old Testament books down through history. Absolute accuracy was taken very seriously. According to Jewish tradition, the sacredness of the divine names must be recognized by the professional scribe who writes the Scriptures. Before transcribing any of the divine names he prepared mentally to sanctify them. Once he began a name he did not stop until it was finished, and he must not be interrupted while writing it, even to greet a king. If an error is made in writing it, it may not be erased, but a line must be drawn round it to show that it is canceled, and the whole page must be put in a genizah (burial place for scripture) and a new page begun. Very serious business. The words "God" and "Lord" (used for the Hebrew Adonai) are often written by many Jews as "G-d" and "L-rd" as a way of avoiding writing a name of God, so as to avoid the risk of sinning by erasing or defacing His name. In Deuteronomy 12:3-4, the Torah exhorts one to destroy idolatry, adding, "you shall not do such to the LORD your God." From this verse it is understood that one should not erase the name of God. The general rabbinic opinion is that this only applies to the sacred Hebrew names of God — but not to the word "God" in English or any other language. Even among Jews who consider it unnecessary, many nonetheless write the name "God" in this way out of respect, and to avoid erasing God's name even in a non-forbidden way. The Old Testament made it clear that misuse of God’s name was such an immensely serious issue that when the scribes copied the scriptures, they left out the vowels in the name of God so that no one could accidentally take His name in vain and sin. Over time, since it was not spoken for fear of using it wrong, the actual pronunciation of God’s name has been lost. YHWH are the actual letters we have. Some have guessed at the vowels and come up with Yahweh. YHWH is the third person singular imperfect of the verb "to be", meaning, therefore, "He is". This explanation agrees with the meaning of the name given in Exodus 3:14, where God is represented as speaking, and hence as using the first person — "I am". Another guess is Jehovah. "Jehovah" was created by adding the vowel points of "Adonai." Early Christian translators of the Torah did not know that these vowel points only served to remind the reader not to pronounce the divine name, but instead say "Adonai," so they pronounced the consonants and vowel points together (a phonological impossibility in Hebrew). They took the letters "IHVH," from the Latin Vulgate, and the vowels "a-o-a" were inserted into the text rendering IAHOVAH or "Iehovah" in 16th century English, which later became "Jehovah." Orthodox and some Conservative Jews never pronounce YHWH for any reason. Some religious non-Orthodox Jews are willing to pronounce it, but for educational purposes only, and never in casual conversation or in prayer. Instead of pronouncing YHWH during prayer, Jews say Adonai. Substituting Adonai for YHWH dates back at least to the 3rd century BCE. Many English translations of the Bible, following the tradition started by William Tyndale, render YHWH as "LORD" (all caps) or "LORD" (small caps), and Adonai as "Lord" (upper & lower case). In a few cases, where "Lord YHWH" (Adonai YHWH) appears, the combination is written as "Lord GOD" (Adonai elohim). Neither "Jehovah" or "Yahweh" is recognized in Judaism. Words such as Elohim (God), El (mighty one), El Shaddai (almighty God), Adonai (master), El Elyon (most high God), Avinu (our Father), etc. are not names, but titles, highlighting different aspects of YHWH, and the various roles which He has. This is similar to how a man may be called by his name, or by 'Dad', 'Husband', 'Boss', 'Sir', 'Son', etc, however his personal name is the only one that can be correctly identified as his name. In the Tanakh, YHWH is the personal name of the God of Israel, where as the other words are titles which are ascribed to Him. I really love these paper dolls - hope you do too! I'm giving you an assortment of separate dolls and two chains. UPDATE - Something is wrong at 4shared...pray for them so that our freebies keep flowing! I've re-uploaded and this is a new link. It works fine for me - let me know if you have problems. If you have a problem, try back tomorrow. I'm so glad you want them and I'm sorry we are having a temporary problem. Keep me posted on how it's going!